How do we as educators support children in their social, emotional and moral development? What is our definition of discipline in our play spaces? What makes the Neo Humanist approach to behavioral management different from or similar to current and historical psychological theory? How do we bridge the gap between theory and practice? These questions were at the heart of a teaching in-service on behavioral management at Sunrise International Preschool held in May of the previous school year. As a teaching team, we had observed an increase in reactionary behavior in our preschool, as well as experienced inconsistent methods for coping with behavior on the part of the general staff. We resolved to create a more comprehensive program for positive behavioral management methods, which would provide both children and staff with a series of tools to negotiate social interaction. What we have produced is a yearlong, ongoing experiment in positive reinforcement, called the S.E.L.F program. Starting with our desired goals, our teaching team identified psychological theory which supported the NHE Standards in practice for Early Childhood, citing Eriksson, Dewey, Bruner, Vygotsky and Kohlberg as our primary sources for theoretical base. After much debate on approach, we found our central themes to return once again to the need to strengthen our preschool’s approaches to moral and ethical development. We returned to the Yama-Niyama, transforming the essence of these values to eight simple principles, capable of being taught to children ages 2-6. Now that we had tools, we needed to communicate them to both the general staff, parents and most importantly the children. We set up the following methods of communication and teaching of the values and incorporated the concepts into our year plan. Each Month, one Value is focused on and explored through theme work, arts, stories, dialogue and daily routine. The last Friday of each month is saved to talk about what we have learned and reinforce the practice of values in our lives, on a full school level. Within the classrooms each week, the value in focus is discussed through age specific tools including emotion, action, activity, visual aid and story. All staff members are present per class, to ensure that the children and adults share a common learning experience. Children help to create 3 clear guideline AGREEMENTS in their classroom, bathroom, cloakroom and outdoor areas, as well as a set of 3 guidelines for taking excursions. These agreements are clearly posted, to remind children of what they should do in these locations. The SELF program makes use of Photography as a medium to promote better understanding of how the values impact our lives. Teachers use Photos of the children to document good practice and positive learning experience. In May, the children get the opportunity to use cameras to photograph the values which they observe being practiced around them. The goal is to promote the feeling of community, and empower the children to become observers and mediators. NHE supports children through acknowledgement and positive experience. Our consistent goal is to encourage the values which are fundamental to NHE, and to provide children with the opportunity to reflect and act upon these positive characteristics. Several Projects occur in the school year which helps to unite the full school in sharing learning, and practicing values. The Build a Heart Project, held in September this year was our first event which brought the concepts of the S.E.L.F. program into focus. Based on a practice mentioned in the book ‘Circle of Love’ by Didi Ananda Mitra, the school community came together to produce Heart Pillows for each individual child. The project was prepared by the teaching staff and sent home as a ‘craft kit’ to the parents. 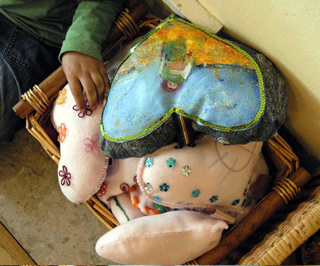 At home, families had one week to create a personalized Heart Pillow, which included items from babyhood, scents, special buttons or decorations, and were assembled together as a family. The Hearts returned to the school for a Friday Circle, which was an event for the children, intended to explore their ‘heart.’ As a full school, we sang songs to our heart, we went on a journey to find the ‘Treasure Within,’ we danced, cuddled and found our center through our heart. Integrating yoga into the storytelling, we used poses such as the warrior, mountain, tree, bird and bow to illustrate how on our search for a special treasure, we looked everywhere in the world around us, only to find the treasure inside our own hearts. Finally, we hung our hearts all over the class rooms. The dangling hearts are cause for a great deal of discussion, about what is inside our hearts, who belongs in our hearts, and what hearts are made of. Hearts come down for cuddles on a regular basis, and are great comforts on rainy mornings when mom and dad have to leave. If we are sad, we go to find our heart and hold it. Our Value in the month of September was Loving Yourself. Through the school project, we have manifested meaning that is understood from the age of 2 to 100. Teachers, parents and guests to the school are united in an immediate and meaningful conversation about Love, Care and NHE. Bringing the circle to a close, we can discuss the impact of the S.E.L.F Program on our Preschool community after the first six weeks of practice. 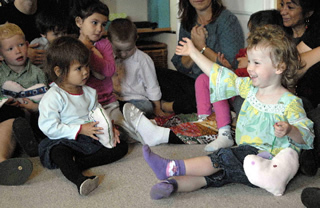 Children have concrete examples of positive and explorative love of themselves, which are represented through diverse learning styles, including the experiential, visual, and verbal approaches. Our community of parents are engaged and in touch with the values being presented and we have a full school year to explore possibilities. Throughout the year, we hope to find similar projects, which unite the school community in a simple but powerful way, allowing the SELF Program to grow and take shape.